When siblings attend a nursery together, they are commonly separated for much of the day as they play amongst children their own ages, and while it is good for them to make friends, it's also important for brothers and sisters to get some time together each day. Ideally, child care centres would organise their programmes so as to accommodate family members' needs, supporting the natural attachment of siblings. One of the benefits of enrolling children in child care programmes is that they are afforded opportunities to interact with other children their own ages, something that children who are home with their families may not experience as frequently. Helping kids to cultivate first friendships promotes healthy social development, so children should be encouraged to play with peers. Additionally, nurseries typically have areas that are designated for specific age groups of children, making it safe for little ones as many items that older kids enjoy can be hazardous for babies and toddlers. With sufficient supplies, quality equipment, and an educated, caring staff available to them, there is no need for children to be bored while at a nursery. Caregivers need to be sure that all of the children in their care are engaged in meaningful activities that stimulate their senses and promote physical, emotional, and social development. Scheduling staff members so that they rotate between age groups can help them to gain an understanding of each stage of childhood development, as well as providing kids with opportunities to spend time with each teacher and helper. In old-fashioned centres, most caregivers spent their time with only one age group, but since many kids develop strong attachments to their career and may feel a temporary sense of loss when they advance from one age category to another at day nurseries, kids can experience jealousy as they see younger siblings engaged with their favourite staff members. By rotating staff, kids learn to interact with and appreciate a number of caregivers, making it easier for them to advance without difficulty. While siblings most certainly benefit from developing their own friendships and interests, parents with more than one child sometimes hesitate to enrol the children in child care centres, seeking other options, such as child minders, who are likely to accommodate siblings in such a way as to allow them the freedom to interact in much the same way they would be if they were at home with Mum and Dad. Nursery owners who schedule "free play" times throughout the day or pair siblings up for meal and snack times can help parents to feel that their children are getting the best of both worlds - room for independent growth and support for the sibling bond. It takes thought and careful planning to organise both space and scheduling at a nursery that supports multi-age play areas. It is far easier to simply segregate the ages, but it can be good for children (even those who do not have siblings in attendance) to understand and bond with both older and younger children. Well supervised playtimes, enlisting older kids to "help" out with younger ones, and scheduling some activities that can be enjoyed by varying ages can work well. 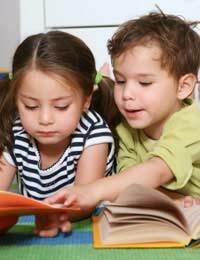 Kids who know how can read stories to smaller kids or lead them in songs, and creative games of make-believe are perfect choices for multi-age groups.